Some studies indicate that 3 out of 4 people suffer from speech anxiety; that is an astounding 75%. Most people would rather jump through rings of fire than give a speech. Just the thought of speaking in public can create sweaty palms. People who can speak in public are revered. Have you ever been afraid to express your opinion? Have you ever believed your not good enough? Or you thought your ideas and opinions had merit but you were unable to articulate your perspective? You are not alone. If you’d like to improve your public speaking skills now is your best hour. 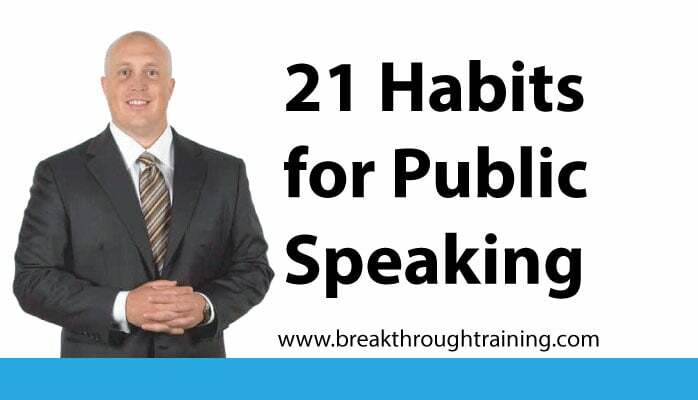 So let’s get started: Here are 21 Real Life Habits for Success ® Improve Your Public Speaking. The first 7 deal primarily with speech format. I am going to share them in a fast paced manner. As you are listening think of which ones you want to acquire. Toward the end of the program I will do a summary of all 21 habits. 1. USE AN ATTENTION GETTER. Light a fire under your audience. Gain attention by telling a quick joke, asking a question, offering a famous quotation, sharing a story or citing a statistic. Use this technique whether you are speaking to an audience for three hours of thirty seconds. An attention getter allows you to focus the mind of your audience. Ultimately, it draws your audience in to listen to what you have to say. 2. INTRODUCE YOURSELF AND YOUR SUBJECT. What is the subject you are addressing? What is the topic you are sharing with your audience? State your subject explicitly. Examples are: “I’d like to talk with you about the importance of recycling.” Or, “I’m going to share with you the differences between a Mac & and a PC.” This is also where you tell your audience who you are, unless you were formally introduced. Even if you are formally introduced, though you can still share with you audience more about who you are and why you are qualified to speak on the subject. 3. STATE YOUR PURPOSE. Why are you speaking? What is your intent? State your purpose to your audience. Tell the audience why you are speaking to them. If your subject is The Importance of Recycling, your purpose may be stated as, “I’d like to share with you why and how you can recycle so we can save the planet.” This tells the audience what you want to achieve as a result of your presentation. 4. PREVIEW YOUR SUBJECT’S MAIN POINTS. What is it that you are going to address in your presentation? This is where you briefly tell your audience what you are going to tell them. Basically, it’s a quick preview of your main points. The preview is a way to help your audience more easily follow what you are going to say. A preview is not always necessary, especially when your presentation is shorter than 2 minutes. 5. ORGANIZE YOUR MAIN POINTS. This is the central content of your message. Avoid making your audience decipher your key points or ideas. Every great written or verbal presentation is well organized. This makes it easy for your message to be understandable and increases your listener’s faith in your expertise. Take a few minutes to jot down your main or central ideas before offering them to others. Shorter presentations should contain less main points. Avoid packing too many main points into your presentation. 6. SUMMARIZE YOUR PRESENTATION. This is simply a quick review of what has been said. Reiterate your main points. This helps your audience to remember what you presented. Basically you follow the process of telling them what you are going to tell them, tell them, and tell them what you told them. Avoid giving your entire presentation again in your summary. 7. CLOSE WITH A CALL TO ACTION. This piece of the presentation should contain your call to action. The purpose of a presentation is to get your audience to take action. What action do you want your audience to take? You might simply want your audience to accept your point of view. You might want them to recycle, to vote in your favor, to volunteer in the community. Whatever it is, ask your audience to take some sort of action. After completing your presentation never open the presentation again. You can do a Q & A session though. 8. GET YOUR HEAD STRAIGHT. Anxiety and nervousness are commonly associated with public speaking. So, the first thing you need to do in order be successful is to get your head straight. Here are a couple of ways to do it: Breathe. Take a couple of breaths a few minutes prior to giving your presentation. This will send a message to your autonomic nervous system that helps relax and calm you. Another great practice to get your head straight is to use an affirmation or mantra. Something like, “I am going to do a great job.” Or, “I am calm and relaxed when speaking.” Or, “I am an excellent speaker.” These statements and others have a powerful affect on the mind since we tend to manifest whatever it is we think about. Most people have negation statements that they are repeating to themselves such as: “I am really scared and nervous.” Or, “I am going to goof this up and look really stupid.” Another powerful way to get your head straight is to think of a successful moment in your life. Or, a time when you really enjoyed yourself. This helps to focus your mind on the positive aspects of life, which leaves no space in your head to think pessimistic thoughts. 9. CREATE AND SHARE YOUR CREDIBILITY. Listeners will be most influenced by a person whom they perceive is knowledgeable and qualified. You are more likely to take financial advice from a millionaire than you are from a street-corner bum. Make your credentials known with such things as academic degrees, awards or successful experiences. You can do this in your introduction as well as throughout your presentation. You can also show the disadvantages of your point of view to demonstrate your ability to “see it as it is.” Another way to create credibility is to demonstrate your confidence, enthusiasm and sincerity when speaking. 10. ASK FOR FEEDBACK. At times we are so blinded by ego that we fail to see our own dysfunctional behavior. Ask your friends, family and business associates, and of course your audience, to give you suggestions on how you might improve your communication. Encourage them to give you honest insight. Let them know that you value their perspectives and opinions. This can also be achieved by having your audience fill out an evaluation form. Be sure to follow their suggestions. You can also video or audio record your presentation and review it to see how you can improve. Major sports teams video record the game so they can review and improve. 11. ELIMINATE FILLER WORDS. Filler words are the words we utter that add nothing. Actually they do add something. They add the perception that you are unsure, lack confidence, and are unable to be articulate, among other things. Some filler words are um, so, ah, and a, okay, and you know. This type of communication conveys that you are unsure of yourself. Powerful language is relatively brief and straightforward, whereas less powerful speech is full of terms that suggest uncertainty or lack of self-confidence. 12. USE EMOTIONAL APPEALS WHEN PERSUADING. Advertisements use emotional appeals to persuade their audiences. They involve the audience by associating a positive feeling toward buying and using their product or service. The key is to appeal to the emotions. Useful examples that promote an emotional appeal could be: “Imagine how that would make you feel if…” and “If that happened to you…” Here are some top emotions to consider: Love, Fear, Joy, Courage, Desire, guilt, Happiness, Surprise, Anticipation, Anger, Panic, Sadness, Hope, Sympathy, Enthusiasm. 13. ANALYZE YOUR AUDIENCE. Work diligently to uncover the beliefs and convictions of your audience. This is valid whether you are giving a speech, making a phone call or writing a letter. Understand their needs, their job positions, their demographics and their personalities. Only then can you structure the appropriate message to get the response that you want. You have missed your mark if you are giving a speech to a room of vegans and your stories and examples are of hunting and eating meat. Know whom you are speaking with if you want to connect with your audience. 16. DRAW ON YOUR PERSONAL EXPERIENCES. When you speak from experience you are not reciting words, you instead are recalling a memory. People like to hear experiences and stories from other people’s lives. Start a journal. Jot down experiences you’d had that emphasize lessons you can use in your presentations. Make sure that the experiences you share relate to your content. 17. USE STATISTICS AND FACTS. According to Gallup News Service the #1 American Fear is Snakes, in second position is Public Speaking. In third place is heights. Interject logic into your presentation. Back your main points with empirical data, research studies, polls, surveys, facts, and the like. People tend to embrace what is said when it appeals to both emotion—and logic. 18. USE THE POWER OF STORY. Story has been used to convey teachings since the dawn of man. The Bible is full of stories. The stories of Aesop still flourish today. George Lucas incited generations through the story of Luke Skywalker. Stories move people and create memories. Shorter stories work better than longer ones when used in a presentation. Audience members tend to lose interest when a story is too long and drawn out. 19. BE REAL. Ever notice a speaker that changes their voice when they address a group? Or the speaker gets stiff or seems contrived. If you want to connect with people then be yourself. The point is to not try to be someone else. Don’t be fake, stay true to your integrity. Be your best self, not someone else. 20. JOIN A PUBLIC SPEAKING GROUP. Toastmaster International is among the most prominent public speaking organizations. It offers a safe place to learn how to enhance your speaking skill set. Most cities have several different chapters. The cost is nominal and includes all workbook materials. You can learn more and find a group near you by visiting toastmasters.org. You can also join other public speaking training and coaching forums that are offered through private training companies. Or take speech classes at your local community college or university. The habit is to take and get involved in as many environments that will allow you to hone your skills. 21. PRACTICE, PRACTICE, PRACTICE. You can practice your presentation while driving in the car, while standing in front of a mirror, while walking down the street, whenever. Grab a small group of friends, family members or coworkers and practice with them. Practice conversationally with one person (after all, there is little difference, just a few more people). Proper practice is really the only way to get better, and of course just giving the presentation is a form of practice. The more times you do it the easier it gets. It is time to step up from knowing to doing. These habits are simple yet they are not always easy to consistently apply. Practice a few of these habits for success and watch your public speaking skills improve to a whole new level.